Power Manager has a long history reaching back to 1997 and System 7. We no longer support the oldest versions but continue to provide downloads for licensed users. 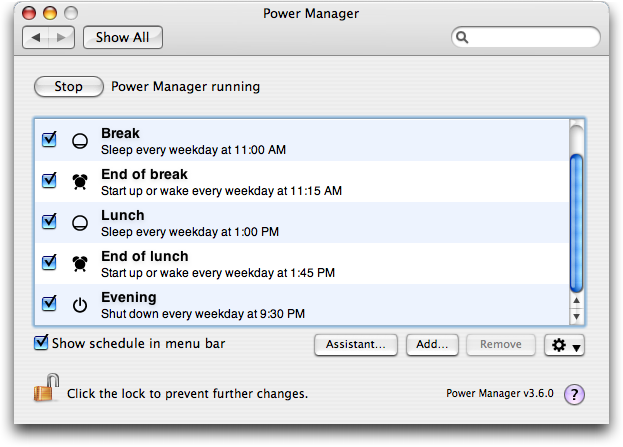 Released in 2005, and only surpassed by Power Manager 4 in late 2010, Power Manager 3 helped thousands of Mac users save energy. Power Manager 3 is no longer available for sale. If you are an existing user, your copy of Power Manager 3 will continue to work with Mac OS X 10.6. We supported Power Manager 3 with critical support until December 2010. On the launch of Power Manager 3 existing users of Power Manager were given free upgrades to the latest version. The first versions of Power Manager ran on System 7.6 and are no longer available for public download.